You are currently browsing the category archive for the ‘18 rules of community engagement’ category. One of the 18 Rules of Community Engagement I outline in my book is simply “Ask Questions.” I believe that people want to express their opinions and asking questions is a sure way to get them to do so. Throw in your own personal story before asking the question and you may strike gold. I’ve gotten many great conversations started that way in the community I manage. It is quite effective. But I am noticing a trend among bloggers, some that I really respect, and that is ending every blog post with a question. I know that asking questions is a way to ask for input and it really is effective in many cases but lately it has felt like you are trying to crowdsource almost everything and I am just asking you to reconsider that approach. See what else you can do to keep us engaged. We follow you because you’re smart. Now dazzle us. I am both humbled and honored to receive the first video review of my book, “18 Rules of Community Engagement” by Jason Falls of Social Media Explorer and wanted to share it here for my readers. It comes on the heels of this review on WiserEarth Blog, and this article and excerpt in EContent Magazine. In the event that you have not read my book, perhaps this video will convince you. You’ll also hear about three other social media books Jason is recommending including Connection Generation by Iggy Pintado, Six Pixels of Separation by Mitch Joel and Andy Sernovitz’s upcoming new addition to Word of Mouth Marketing, which has not yet been released. So take a few minutes and listen to what Jason has to say about the book. Four Books Worth Reading from Jason Falls on Vimeo. If you’d like to read the first chapter of my book, “If you build it will they come?” Check out the September issue of EContent magazine. You can read the print copy or get the online version. Here’s a link: If You Build it Will They Come? I’d like to thank editor, Michelle Manafy for her interest in my work and for sharing it with the EContent community. This is a cross post from the blog, Newspaprgirl. Author Janet Thaeler asked me to share my top five rules of community engagement and I was happy to oblige. Janet is currently working on a book about online marketing. Have you ever struck up a conversation with a complete stranger in the checkout line at the grocery store once you both realize the line hasn’t moved in the last ten minutes? Perhaps you’ve locked eyes briefly with a parent as you both painfully watched another parent manhandle their screaming 3-year-old at the park. The connections you make with strangers in these types of situations are based on a shared experience. Something that affects you both and has no bearing on whether or not you were previously acquainted. These are the same connections we can make online, and sharing personal experiences is one of the most effective ways to engage an online community. As a community manager, I have employed many tactics to engage members and encourage participation. Some work better than others but nothing seems to resonate more than a personal story. When you share something personal, it evokes emotion and prompts others to share similar experiences. When I blogged about the anniversary of my father’s death, stories about dad’s who’d died too soon poured in and the level of sharing was unbelievable. The same thing happened when I recounted a time in high school when I almost froze to death while waiting for the city bus. It was as if there was suddenly a competition to see who had endured the worst winters and could recall all of the gruesome details. If you ever want to start a conversation fast, sharing something personal will get the job done. If you share something from your own life, it is almost certain others will follow suit. It is what I consider one of the top five rules of community engagement. Flattery will get you everywhere. It is imperative that you go above and beyond in this department. When you have constant contributors, and people who are vested in the best interest of the community, you have to express your grattitude. and tell them how much you need and appreciate them. Never underestimate the power of a question. Ask members what they think about current events, or potential changes in the community or forum.Find out what they think about local and national issues. Ad don’t think your questions have to be intellectual. Sometimes something as simple as “What are you cooking for dinner tonight?” can create a major dialog. This simply shows that you’re human. Building an open honest relationship with your community is key. When people know that you are accessible and available and willing to hear them out and respond, you build a level of respect that cannot be bought. It also illustrates your commitment to the community and how much you value their presence. Today’s consumers are faced with infinite choices, and if you don’t provide an experience worth their time, they won’t be back. Remember, we are living in the conversation age, where the number of choices online are infinite and the audience that was once easily bought must now be earned. Okay, it’s my first stab at a video for this blog. I shot it in my kitchen using my BlackBerry very close to midnight. The good part is I’m well aware of the lack of video quality and I promise if I decide to shoot more video, I will invest in a flip camera! 18 Rules of Community Engagement, by Angela Connor from Angela Connor on Vimeo. 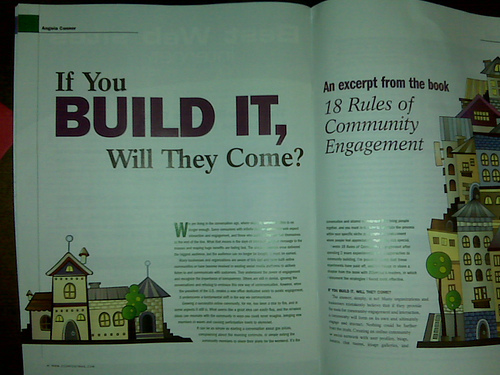 18 Rules of Community Engagement launches today! 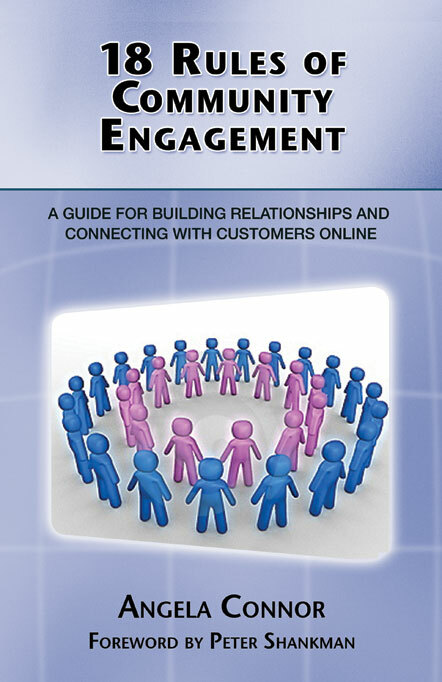 18 Rules of Community Engagement: A Guide to Building Relationships and Connecting with Customers Online (Happy About Publishing) is officially out today on all major online retailer sites. You’ve read my blog, seen the endorsements and maybe even downloaded a free chapter from the book website, so what are you waiting for? You’ve got a community to engage, so get your copy today. I hope you enjoy reading 18 Rules of Community Engagement and I can’t wait to get your feedback. An online community can bring new business and visibility , yet most businesses build an online community that fails to attract members. A new guide shows how to beat the odds and attract thousands of people. The principles in this new book can be applied to any social network or business community that wants to grow their membership base. Cupertino, CA (PRWEB) June 9, 2009 — Building an online community with active, participating members is a challenge. Over half of businesses that attempt it fail to get over a thousand members. That’s why Angela Connor wrote the guide to building relationships and connecting with customers online. The book ’18 Rules of Community Engagement,’ outlines the principles Connor used to take the online news community for the top-rated TV station in North Carolina from 0 to 11,000 members in just eighteen months. A study of more than 100 businesses with online communities found that 35% had less than 100 members and less than 25% had more than 1,000 members. Recently, Sam’s Club announced a new community for small businesses owners. They had an existing network of thousands to draw on. Most businesses don’t have that luxury. Building community can be daunting whether it’s on an existing social network or a branded community for business. The principles taught in this book can be applied to building an online community on social media sites, on a branded community site, or on a blog. The key is to interact – to be social – in a way that builds value. “In the age of instant communications, where we are constantly connected and faced with infinite choices, consumers want and expect more. We are now living in the conversation age, where one-way communication is no longer acceptable or desired. People want to engage and discuss, react and interact,” notes Connor. 1. Give people something to talk about. 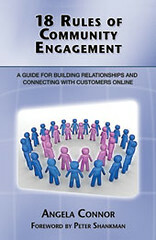 The book provides examples of tactics to use to connect with people and help them connect with others. An online community thrives when a community manager facilitates interaction. This guide tells exactly how. What’s the best way to deal with troublemakers who harm communities? What’s the best way to encourage participation when stats say most participants are lurkers who don’t contribute? How much time is required each day to grow an online community? What’s the best way to help community members feel appreciated and welcomed so they not only stay, but help drive the community? Learn this and more from someone who has achieved what most businesses have not.. Build a strong online community and bring greater visibility and new customers. Happy About® books educate, entertain and evoke. You will quickly gain wisdom with our smaller, compact, high-impact books. Visit Happy About at http://happyabout.info and http://42rules.com for more info. For quantity discounts, please contact the publisher, Mitchell Levy at mlevy(at) happyabout.info, 408-257-3000. If you want to explore publishing a nonfiction business book, we don’t need a long book proposal. Please, contact the publisher and ask for the “6 questions” or go to this url: http://happyabout.info/contribute.php.